Almost all early stage medical device companies are extremely risky investments. The projected valuations of these stocks are hanging on to a thread, being solely based on the pending results and approval of potential life saving devices and procedures. These companies are not profitable and have accumulated a large deficit due to their focus on research and development. Neovasc Inc. (NVCIF) is no different. Buying stock in this company is extremely speculative and risky. Having said that, I believe Neovasc Inc offers one of the most compelling risk/reward profiles I have ever seen, and speculative investors should consider opening a position in this company immediately, here's why. Neovasc is a Canadian medical device company that focuses on manufacturing innovative products for the rapidly growing cardiovascular market place. The company operates three different divisions: the production and sale of tissue products to third party medical companies, the development of the Neovasc Reducer, and the development of the Neovasc Tiara. The company was incorporated in 1998, and commenced their business operations in 2002 with the acquisition of Neovasc Medical. The company is made up of several mergers, which have all funneled down to Neovasc's three main business divisions. Neovasc is not profitable, and as of June 2013, they had an accumulated deficit of $74 million. This number continues to rise as the company develops and conducts trials on the Reducer and Tiara. With current share prices hovering around $2.50, the company has a market cap of approximately $110 million. I believe Neovasc's growing tissue division, and the value of their Reducer and Tiara, have the potential to propel this company into a multi billion-dollar market and considerably increase their share price in the near future. 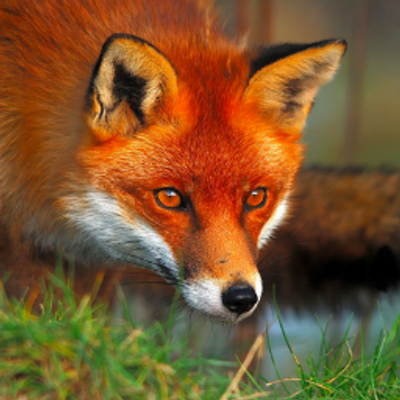 Neovasc has a core, profitable business of converting animal skin into biological tissue that is used in medical devices that are implanted into patients, called Peripatch. More specifically, these tissues are used for aortic and mitral heart valves, surgical patches, artificial heart components, covered stent grafts, and specialized vascular devices. Peripatch received a CE designation and FDA approval in 2009. The company recently sold the rights to their surgical patch unit to LeMaitre Vascular in October of 2012 for $4.6 million. The divestment of this unit has allowed the company to focus their attention on the production of their higher margin tissues that are used for heart valves. The company utilizes a state of the art facility and has a highly skilled workforce that develops and manufactures the biological tissue. The animal skin that is converted into tissue is sourced from various slaughterhouses located in the US, Europe, and Canada. The company has ample FDA approved clean rooms to meet the increasing volume demand from their clients. Currently, upwards of five medical device companies receive the Peripatch tissue and consulting services for their devices from Neovasc. The tissue is also incorporated in Neovasc's Reducer and Tiara. 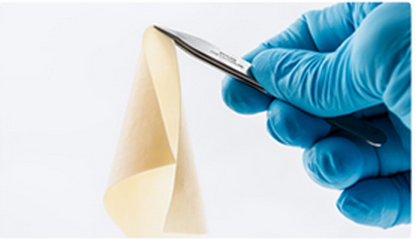 Neovasc's customers use the tissue as a component of their medical devices, which are currently, or soon to be undergoing clinical trials and awaiting FDA approval. Though the company has not disclosed the identity of their customers, possible candidates include Edwards Lifesciences (EW), Medtronic (MDT), and Boston Scientific (BSX). All of these companies use tissue leaflets for their transcatheter valves. If any devices from Neovasc's five customers succeed in gaining FDA approval, then the company should experience a sharp increase in demand for their Peripatch tissue. The trans-catheter aortic heart valve market has grown from $200 million in 2010, to more than $1 billion this year. It is expected to surpass $2 billion by 2014. The trans-catheter mitral valve market is expected to reach $1 billion by 2015. Neovasc's Peripatch division has experienced strong growth in revenues and continues to increase their profitability margin. The company's division generated $7.8 million in revenue in 2012, and is on track to generate nearly $10 million in 2013, having already recorded sales of $4.8 million in the first half of 2013. CEO Alexeis Marko believes Peripatch can become a $30+ million business over the next four years. Again, these revenues are derived from the sale of the Peripatch tissue that is utilized in medical devices currently undergoing trials, and through the consulting services Neovasc provides to their customers. With Edwards Lifesciences recently obtaining FDA approval, and Medtronic, Boston Scientific, and others on the verge of obtaining FDA approval for their transcatheter devices, investors should expect Neovasc to experience continuous growth in revenues from their tissue business in the upcoming quarters. Almost all of Neovasc's earnings that are derived from the tissue business are used to fund the development of the Reducer and Tiara. This is a unique position to be in for a small medical device company, who would usually have to hold several rounds of stock offerings to fund their operations and in effect would create dilution for current shareholders. With a strong uptrend in revenue growth for Peripatch, Neovasc should have ample resources to fund the continued research of their products for the foreseeable future. One last piece of information that is encouraging for Neovasc and its investors is the fact that all five of their customers need Peripatch desperately. If any of the customers for some reason switched Neovasc's Peripatch tissue for another company's in their devices, they would have to restart the entire FDA approval process, trials and all, which would delay the development of their product by a number of years. Because the Peripatch tissue is crucial for Neovasc's customers, they cannot afford to lose access to it. Therefore, if for some reason Neovasc's two products under development do not pan out as expected, then there is still significant value in the Peripatch division and a bidding war between Neovasc's two largest customers would most likely commence. Now here lies the true potential within this company. 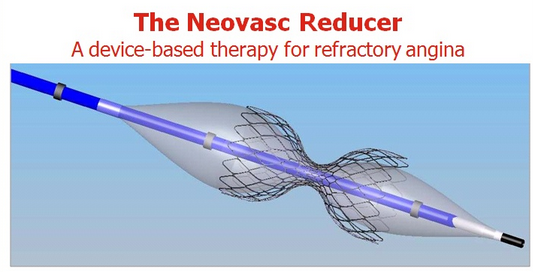 The Neovasc Reducer is a medical device used for the treatment of refractory angina, a life-threatening condition that causes constant and severe heart pain and is a significant disability that negatively impacts the quality of life for patients. The Reducer is implanted via a minimally invasive procedure that narrows the coronary sinus through the implantation of the device. Currently, there are limited treatments available for this heart condition, besides catheterizations, and invasive surgery that is expensive, minimally effective, and only suitable for a small population of patients. The Reducer uses non-surgical techniques to implant the device. The total procedure time takes less than 20 minutes, and patients are discharged within a day. Even more impressive than the procedure time, are the results. The Neovasc Reducer is truly a one of a kind product that has already improved the lives of many. One patient, who had a CCS grade of III, which means patients experience symptoms with everyday living activities, could not walk more than 200 meters on a flat level, and suffered severe symptoms when climbing a few stairs. Six months later, after implementation of the Reducer, the patient has a CCS grade of I, meaning patients experience symptoms only during prolonged physical activity, and is now able to ride a bike for up to sixty minutes a day. The medical community is excited about this device. Key opinion leaders are working as advisors on the Reducer program, including doctors from Harvard, MIT, Columbia University,and Tel Aviv Souraski Medical Center. The Reducer has already received a CE mark designation in Europe, and six-month follow up data from their COSIRA trial, a rigorous, sham-controlled study with more than 120 patients enrolled, is expected to be released within the next month. If the Cosira results are positive, Neovasc plans to form a distribution partnership with a medical company, or sell their device to a medical company that already provides similar cardiovascular devices. Neovasc has no sales team in place, and with commercialization in Europe right around the corner, it does not look like Neovasc plans on building a sales team either. Some potential suitors include Edwards Lifesciences, Medtronic, Boston Scientific, and Abbott (ABT). The company plans to begin US trials after the COSIRA study is completed. There are more than 2.5 million patients in the US, Canada, and Europe that suffer from refractory angina, 400,000 new patients are diagnosed annually, and 1 million patients per year under go repeated surgeries and catheterizations to treat the problem. With a projected selling price of $3,000, that leaves a total combined market potential of more than $10 billion. With Neovasc's current market cap sitting near $110 million, I believe there is a lot of room for stock price appreciation, based off of the Reducer alone. There is one more important component for this company, and that's The Tiara, a possible diamond sitting on Neovasc's lap. 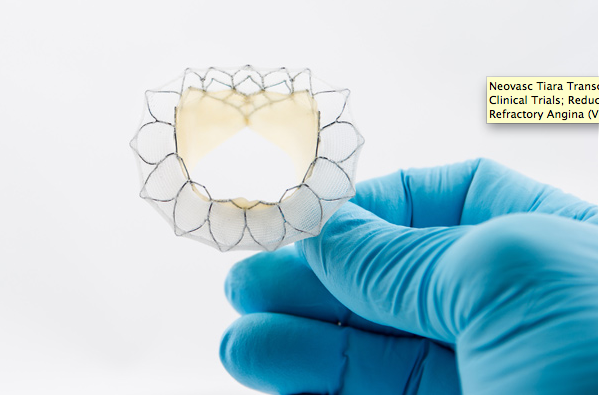 The Tiara is a transcatheter device that treats mitral regurgitation. Mitral Regurgitation (MR) occurs when the diseased mitral valve allows blood leakage into the left atrium. This is often a severe condition that can lead to heart failure and death. Currently, there is no effective treatment besides conventional surgery, which is extremely expensive, and only appropriate for approximately 20% of patients. This short video highlights The Tiara and its lifesaving potential. The Tiara was selected as a best new device concept at the TCT 2012 Scientific Symposium, and recent tests in animals have been successful. The Tiara device was successfully implanted in 81% of test animals, and total procedure times were only 17 to 26 minutes long. The results in the animals were promising as well. There was no obstruction to the left ventricular outflow tract, no encroachment on the aortic valve, and no significant paravalvular leak. Furthermore, the Tiara device demonstrated solid function more than three months after the devices were implanted. While The Tiara is still in early stages of development, the potential value behind this device is staggering. First, it should be noted that because of the complexity of mitral valve anatomy, the development of transcatheter devices used to treat MR have lagged far behind aortic valve devices. In other words, there will be very few competitors in the Mitral Valve device space, and based off of available data, The Tiara seems to be the frontrunner. There are approximately 4 million patients in the US alone who suffer from MR, and approximately 600,000 new patients are diagnosed with MR in Europe and the US annually. This device is priceless. The market potential could be tens of billions of dollars, and Neovasc is the first company to make headway with an effective device for MR. The company expects to begin human trials soon, and plans to apply for CE designation in Europe in the next two to four years. The Tiara would take years to come to the market, but if proven effective and safe in human trials, the valuations could be massive. The risks surrounding Neovasc are minimal when examining the upside potential. If The Reducer and The Tiara fail, then the potential value of this company would drop significantly, and the idea of entering a billion dollar market would be far fetched. Furthermore, if any of Neovasc's five customers fail and abandon the development of their devices, Neovasc would experience a decline in revenues. With shares currently trading near $2.50, I believe downside is limited to $1.50, which would be a conservative takeover price if a bidding war ensued between Neovasc's large medical device customers for their Peripatch division. Because Neovasc's customers are most likely competing with each other in the heart valve market, the winning bidder of the division would have the ability to stop supplying their competitor with Peripatch tissue, and effectively set back the development of their competitor's device by a number of years. Because of this, I believe the Peripatch business is worth upwards of $3.00 per share. A bidding war for the tissue division could get pricey in a short amount of time, which would be great for shareholders. If Neovasc's tissue division continues to post strong growth rates, and if The Reducer's 6-month follow up data is positive in its COSIRA trial, and the company enters a definitive agreement with a large medical company, I believe Neovasc can reach upwards of $7.00 per share. If you include the possibility of The Tiara proving to be safe and effective in humans for the treatment of MR, then I believe Neovasc would be comfortably worth more than $10.00 per share. I don't want to come off as a broken record, but it pays to follow Dr. Frost's investments. Just take a look at a six-month chart of Castle Brands (ROX), Opko Health (OPK), Safestitch Medical (SFES), Ladenburg Thalmann Financial (LTS), or Tiger Media (IDI). The list goes on. Dr. Frost has had an impressive track record with his previous and current investments, and Neovasc has the potential to be his next big winner. Frost owns more than 32.3% of Neovasc, and has been buying shares since 2008. Dr. Frost last purchased stock in January of 2012 at $1.35 a share. If you couple that with the fact that management and insiders hold approximately 75% of shares outstanding, Neovasc seems primed to rise. As mentioned earlier, Neovasc is a Canadian company. Their stock is listed on the TSX Venture Exchange as NVC.V. However, there is also a US, over the counter issued stock that you can buy in US dollars. Purchasing shares of NVCIF will take your US currency, convert it into Canadian dollars at the current exchange rate and charge an extremely fair conversion rate, almost negligible, and then automatically purchase shares of Neovasc from the TSX Venture Exchange. When you purchase shares of NVCIF, your order goes directly to the Venture Exchange. American investors who want to purchase Neovasc, or already have, should follow NVC.V for up to date price and volume quotes, and buy or sell their holdings through the over the counter option . When referencing NVC.V for current price quotes, remember that the stock is listed in Canadian dollars. The quote for NVCIF is never accurate, and should only be referenced to when selling or buying. It is often a day or two behind with regards to volume, and is not reliable. Also, if you have a foreign account set up with your broker, you can convert your money to Canadian dollars and purchase Neovasc directly off of the TSX Venture Exchange yourself. This is a thinly traded stock with low volume. Some days, for NVCIF zero shares are traded. The bid/ask quote for NVCIF is often separated by at least $0.10, but this is solely due to the conversion rate. The logistics behind trading Neovasc should not intimidate investors who are willing to sit tight on a promising investment, and these small complexities are a key reason why this company is grossly undervalued. I purchased shares of NVCIF at $2.41, and saw my exact purchase amount directly on the TSX listing of Neovasc approximately 15 minutes after my order went through. If you purchase NVCIF, be patient, the order went through, it's just delayed by a couple of minutes to see on the NVC listing. Neovasc Inc. is a unique medical device company that has promising growth potential and plenty of risk, just like any other small cap medical company. What sets Neovasc apart from others are the promising results from both of their devices, the fact that they are primarily funding their research and development through their own tissue division, and the lack of investor awareness. Neovasc provides a compelling opportunity for investors. The stock has been trading sideways for almost a year, and the expected release of the COSIRA data next month may be the catalyst needed to kick this stock above its resistance level of $3.00. With data being released imminently for both The Reducer and The Tiara, and a compelling risk/reward profile, investors should consider opening a position in Neovasc below the $3.00 level. All Information was sourced from multiple corporate presentations (here, here, and here) and quarterly and annual filings from the company (here, here, and here). No Comment to " Neovasc: Overlooked Medical Device Company Has Tremendous Upside And Limited Downside "